We now live in an age where the Next Big Artist is being found online. Justin Bieber* was discovered on YouTube and being Vine Famous is now C-list enough to get you on Dancing With The Stars. 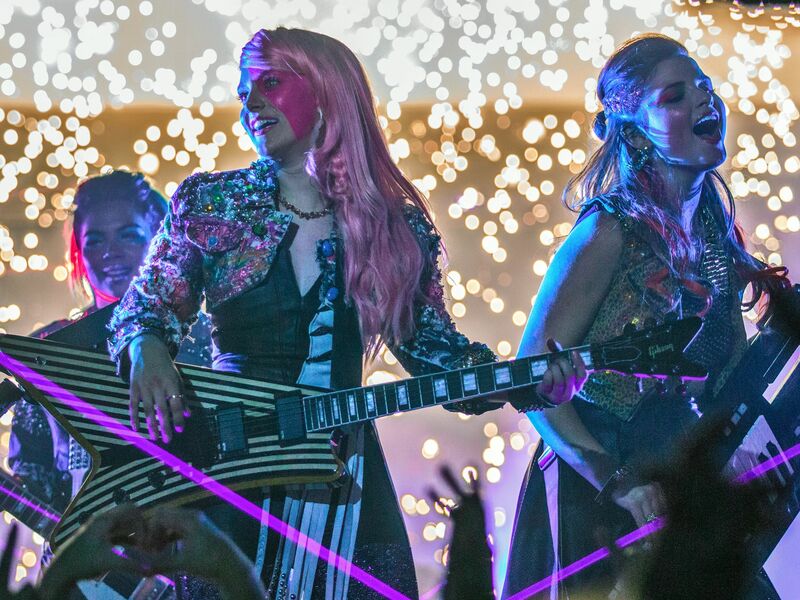 It should then come as no surprise that the reimagining of ‘Jem and the Holograms‘ involves a viral video. Jerrica, being an overly shy singer-songwriter, records a song dressed in disguise as Jem. When her sister Kimber discovers the video on her camera, she secretly posts it to YouTube. The video goes viral and Jem is offered a record deal by THE Erica Raymond (Juliette Lewis) of Starlight Enterprises, which couldn’t have happened at a better time, since Jerrica’s aunt Bailey (Molly Ringwald) is about to lose their house. Jerrica accepts the offer, but only if her sisters get to come along as her band. Cue the makeover montage! The movie gets a little crazy from here: There’s a robot (51N3RGY or Synergy) that leads them on a scavenger hunt throughout LA (I know, this sounds INSANE, but it’s a kids movie and it was actually really cute and it worked. ), Erica Raymond’s scheming to get Jem to be a solo act, the love story between Jerrica and Rio, and Jerrica’s search for the “real” her. Everything is surprisingly woven together pretty well. It worked. It was fun. I enjoyed it. And if I were 8-14 I would have lost my mind because it was so awesome. Or “fire” as the kids say. The Internet plays a huge role in this movie. In fact, it’s shoved down your throat. The film opens with YouTube clips of musicians, then blends into voiceover of Jerrica’s confessionnal vlog. Clips from Instagram, YouTube, and various other social media platforms are woven into the film. It works surprisingly well sometimes, like during the final musical performance of the film. Clips of people discussing what Jem means to them brings some powerful emotion to an otherwise frivolous teen drama. But other times the clips distract from the film, like when step or drum routines are cut to during more intense scenes. Fans of the original cartoon show will not be disappointed in this film. There are tons of nostalgia bombs throughout, including nods to Synergy, quotes from the theme song, cameos by the original voices of Jem, and more. The costumes are astounding. During the second performance, Jem is dressed in a beautiful Lady Gaga-esque dress. The musical performances are a lot of fun. The songs are incredibly catchy (I’m not ashamed to tell you I’ve listened to Youngblood several times on repeat while writing the review.). Most importantly though, the film also stays true to the overwhelming positive message the show had of Friendship and Sisterhood. Although Jem is advertised as being “from the studio that brought you Pitch Perfect”, it lacks Pitch Perfect’s wit and charm. The dialogue is not as clever and the delivery and timing of jokes is off. 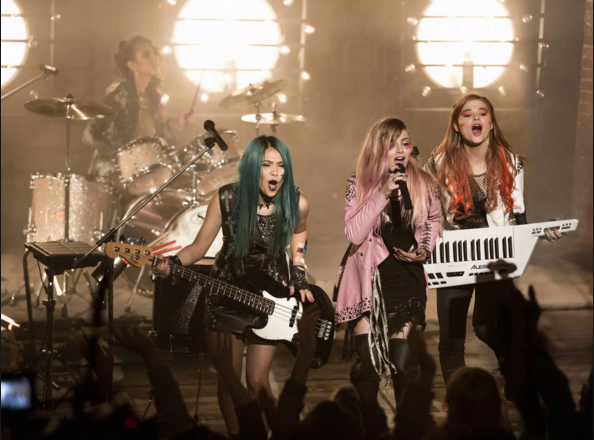 Jem and the Holograms could have benefitted from being a bit more campy and having more original songs. I would have liked to see something more along the lines of 2001’s Josie and The Pussycats. Aubrey Peeples’ performance as Jem is reminiscent of Kristen Stewart and other young adult trilogy actors. She delivers her performance as the shy Jerrica with an heavy air that comes across more as exhausted than brooding. Most disappointing was Juliette Lewis’ Erica Raymond. Instead of a strong and conniving villain, we were given a stereotypical bitchy business woman. For a film that opens with the a comment regarding how thinking five women under one roof would be drama-filled is sexist, it was disappointing to see the sexist trope of the bitchy boss. 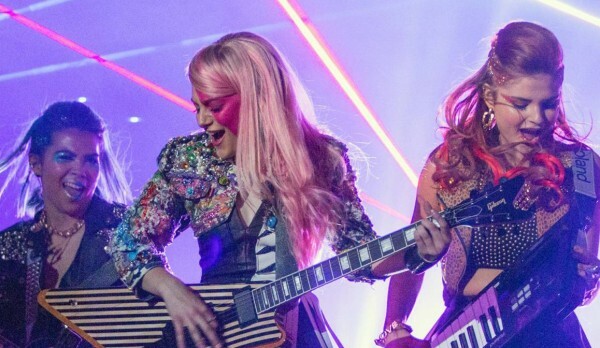 I will be completely honest: I did not expect to enjoy ‘Jem and the Holograms‘. The trailer made the film look terrible and more like a cheap found-on-YouTube Hannah Montana knock off. I went into this film with my popcorn and Coke Icee ready to roll my eyes and heckle a Fifty Shades of Grey level train-wreck. Instead I sat through a fun, heartwarming teenage musical adventure and loved nearly every minute of it. Let’s be honest. Jem isn’t going to win Academy Awards, but it’s definitely a FUN movie. If you’re looking for a cute musical adventure to take your daughter/niece/teenaged girlfriend to this weekend, then LOOK NO FURTHER! Jem delivers with catchy songs, over-the-top costumes, and lots of heart. *Fun fact: I misspelled Bieber originally and my computer’s spell-check corrected it. MY COMPUTER KNOWS THE CORRECT SPELLING OF JUSTIN BIEBER. WELCOME TO 2015. Film Review: ‘Pride, prejudice, and Zombies’! This entry was posted on Thursday, October 22nd, 2015 at 11:45 pm	and is filed under Film, News. You can follow any responses to this entry through the RSS 2.0 feed. You can skip to the end and leave a response. Pinging is currently not allowed. [Fletcher is trying to convince Greta to believe her about Max's wish] You don't believe me, do you? [laughs dryly] Hahaha. How ironic. Okay, ask me something. Ask me something which you think I lied about. Okay. Remember a few months' back when I asked you about a raise...? Forget it. I don't wanna do this!